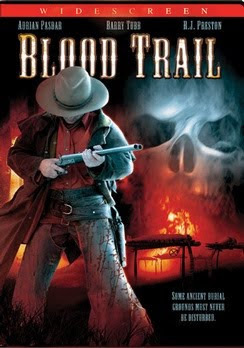 Blood Trail has a good idea and some decent actors but it just doesn't come together. The plot is about some Indians and cowboys that try to find out about an ancient burial ground. It's nice that Lion's Gate helps this movie out with a DVD release after 8 years but it wasn't worth it. It also falls into the hindering trap of "sped up motion". That means when any sort of violence or action occurs on screen, the film is "sped up" in the editing room for some unknown reason. This gives the film an air of ridiculousness. The DVD cover and the plot description make it look exciting, so don't be tricked by Lionsgate's slick marketing.